Recent protests by students against the downgrading of the Tibetan language as a medium of instruction in schools and colleges were backed by teachers. But the authorities insist that a Chinese medium education will help minority groups to secure more jobs and places in universities. The Dalai Lama, on a visit to Japan in early November, said: "We love our language and we are proud of our language." He added: "Chinese authority has imposed Chinese language as a medium of instruction in Tibetan schools which caused demonstrations." Lobsang Sangay, a senior fellow at Harvard Law School and a candidate in upcoming elections for prime minister of the Tibetan government in exile, said language was a matter of identity for Tibetans. He added that the language issue had broader implications for the education and employment prospects of Tibetans, with resentment building up over lack of opportunities. "The situation in Tibet is still tense and more or less under martial law," making it difficult for Tibetans to speak out, Sangay told University World News. However, "the demonstrations follow a new emphasis in Qinghai province on the importance of the Chinese language." The protests in Qinghai province in western China were sparked by an order that all lessons and textbooks should be in Chinese in primary schools by 2015 as part of a government policy to "help Tibetans integrate into Chinese society and find better jobs". In particular the authorities want to narrow the gap between education levels in western China, including Qinghai, and China's coastal areas. An open letter issued by the Qinghai provincial government to all teachers and students on 22 October said the goal of the new policy was to "bridge the education gap between China's various ethnic groups and promote development in ethnic minority areas". The protests later spread to Beijing's Minzu University for minorities (formerly Central University for Nationalities), and groups monitoring Tibet and other minority areas suggested the protests were more widespread than admitted eventually in official media. Tibetan sources said one factor behind the protests was resentment over a lack of places in universities and poor job prospects when students graduated. While anxiety over jobs has grown among students and graduates all over China, prospects for Tibetans are particularly poor because of the dominance of the Chinese language for all jobs and employer discrimination against Tibetan job-seekers even in Tibetan-speaking areas. In September several hundred Tibetan graduates at the Institute of Tibetan Traditional Medicine protested in front of the Tibet Autonomous Region Offices in Lhasa, demanding an increase in employment opportunities for Tibetans, the International Campaign for Tibet reported. And memories have not faded over the creation of 100 new government jobs for graduates in Tibet four years ago, when only two posts were assigned to Tibetan graduates and the rest went to Han Chinese, sparking protests at Lhasa University. "The new education measures will make finding work even more difficult for those Tibetan university students who will be seeking employment as teachers in the Tibetan language," said Tsering Dorje, a teacher based in Dharamsala, India, home of the Tibetan government in exile. Hundreds of Tibetan schoolteachers signed a petition sent to the Qinghai provincial government in October, demanding the preservation of Tibetan as the medium of instruction in schools. "Tibetan students have studied Chinese for 10 or more years, from elementary school until upper middle school - but they are still unable to communicate in Chinese," the petition said. It went on to say: "The choice of which language is used for instruction should be decided entirely upon which language is not an obstacle to the student's studies. An individual's wisdom and their ability to analyse problems is intimately connected to the development of their language abilities." Before, few Tibetans could go to university because they did not do well in the national competitive entrance examination, which was in Chinese. Then the education ministry set up special classes for minorities and allowed local education departments to hold their own entrance exams. By 2005 the average number of students enrolled in colleges and universities in the Tibetan Autonomous Region was 1,139 per 100,000 people or 1.4%, according to official figures, compared with other provinces with low university enrolments such as Guizhou (838 per 100,000), Yunnan, the province bordering on Vietnam with many hill tribes (904), and Qinghai (905). The national average in 2005 was 1,613. Officials claimed the policies extended opportunities for Tibetans, without lowering the quality of higher education in the provinces. But Sangay pointed out that less than 5% of Tibetan students attended universities in China. "At the top universities like Peking, Tsinghua and Fudan, there are a dozen Tibetan students at most. Even at Minzu, around 6,000 [or about half the student body] students are Han," he said. "They are not minorities at all." "If they really want to increase the number of Tibetans entering university they can start by giving Tibetans more places and increase the number of seats for minorities in Beijing," Sangay said. Even at the University of Lhasa, where the medium of instruction for most subjects, including the history of Tibet, is Chinese, 50% of students are Han Chinese. And at the School of Agriculture and Animal Husbandry "supposedly established for Tibetans in Tibet" the majority are also Han Chinese," Sangay said. "It begs the questions of who is really being educated in Tibet." According to the non-governmental organisation, Tibet Poverty Alleviation Fund, widely regarded as reliable on research in Tibet, 70% of private sector jobs and half of all public sector jobs go to Han Chinese in the region. Meanwhile some 40% of Tibetans are unemployed in the Tibetan Autonomous Region. The policy to teach only in Chinese will disadvantage Tibetans, as it replaces a commitment for schools to be bilingual. "In the past teaching only in Chinese was not possible because [the authorities] could not convince [Han] Chinese teachers to come to teach in the remoter areas and villages," said Sangay. "But what this now means is they are throwing out national bilingual education and mandating the Chinese language. It is sinisisation. It is part of their policy of assimilation [of Tibetans] at the cultural level," he continued. 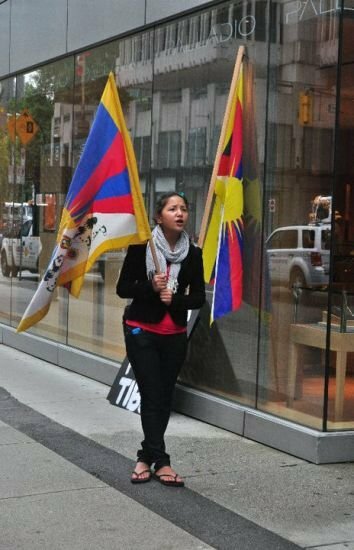 "With this sinisisation, Tibetans cannot possibly compete with Han Chinese, who will always speak and write the language better, and they will lose their own identity which they gain through Tibetan." Sangay cited Article 4 of the Chinese Constitution and Article 37 of the 1984 Minority Nationality Act that clearly indicate the language of each nationality should be the medium of instruction in schools and in government wherever minorities are dominant. This has been followed in the Uigur and Mongolian regions, Sangay said, where the medium of instruction in schools and colleges is Uigur and Mongolian respectively.